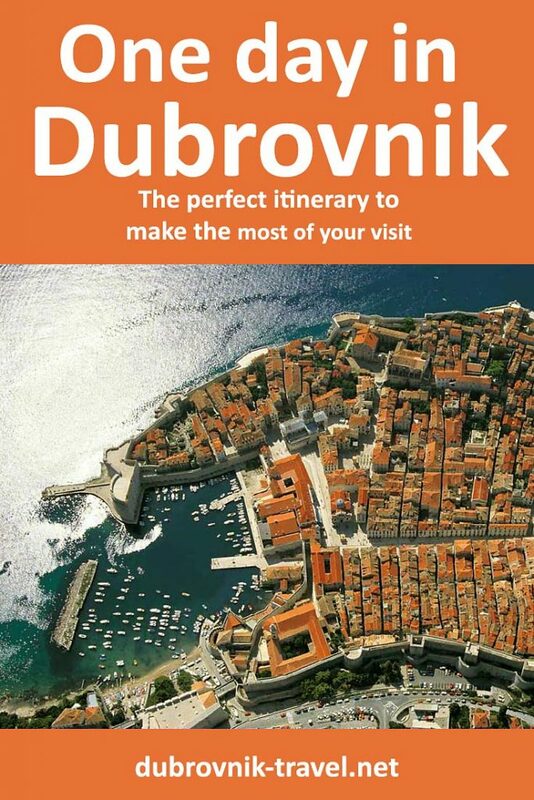 ‘Can you do Dubrovnik in one day?‘ or ‘is one day in Dubrovnik enough?‘ is a question I frequently get in my emails. 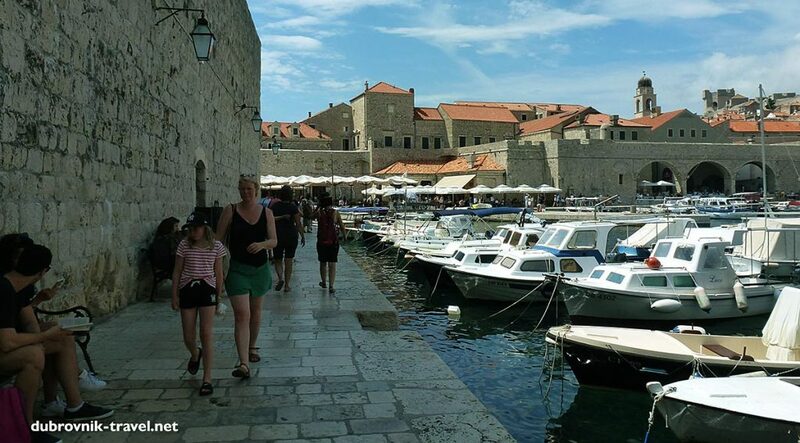 Most of the people who ask this question are either arriving in Dubrovnik by cruise ship or just staying for one night in the city and are looking for a good itinerary, for the best way to spend just one day in Dubrovnik and make it a perfect day. The answer is yes, you can get the best of Dubrovnik in only one day thanks to the fact that the main town attractions are all compactly dotted in the historical core of the Old Town. The Old town is fairly small, traffic-free zone to be explored on foot only. If you carefully plan your visit you will be able to see top sights, experience some restaurants or cafes, swim in the local beach and get a glimpse of a town’s nightlife. You will start a day very early, preferably to be in the Old Town at about 7 am. Your day will finish late in the night in one of the local nightclubs. In the meantime, you will see all the main town’s attractions, enjoy drinks and coffees, have a brief lunch, lazy afternoon on the beach, early evening cocktail with a view and a lovely dinner. If you follow this guide, you will do all the best things one can experience over 24 hours in the town. Here is a map to follow your journey. (2 hrs) – My recommendation is to visit the town walls first thing in the morning. Get up early and start your day before 8 am when the town walls open for visitors. Start from Ploce Gate (instead of Pile) as this entrance is always less busy than another, more popular one. If you are an early riser, get into the Old town at around 7 am when cafes open and get breakfast there before your 8 am town walls walk. The recommended cafe to start your day is @ Cele, on the corner with Stradun and Luza square. 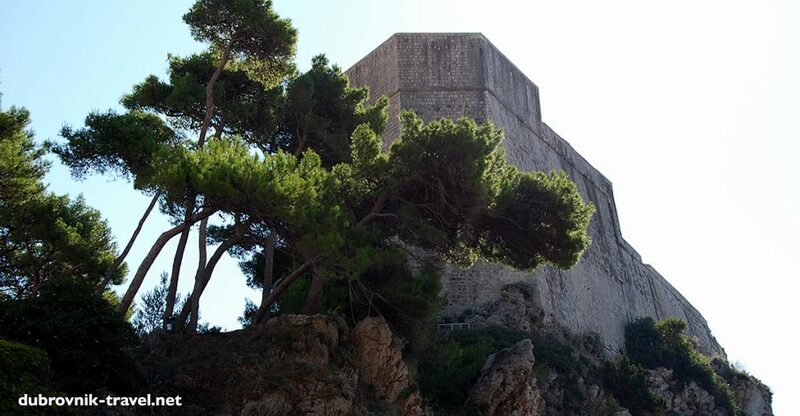 The entrance ticket to town walls is 200 kuna per person, but instead, I recommend you to buy Dubrovnik card online in advance that is valid for 1 day (24 hours) from the time of activation which is on your first visit of included culture or historic site. The card includes free entrance to 6 museums, 2 galleries and the city walls as well as 24h bus rides on public transport. If for any reason you can not get to the Old Town early enough, then the best time to explore the town walls is late afternoon or early evening, after 4 pm, when the walls get less busy. If you decided to do so, try to stay on the walls until the sunset as this is probably one of the best places in the town to watch the sunset. Walking along the walls, which is the main highlight of your visit, take usually about an hour or if you frequently stop to admire the views and take photos, it will be more like an hour and a half. Bear in mind that this walk involves quite a few steps, therefore, make sure you give yourself plenty of time and energy to complete the circuit. (2 hours) – After completing the town walls circuit which will already be about 10 am, the next thing is exploring the Luza Square and the Old Port. There is plenty to see here in this small patch of the town. 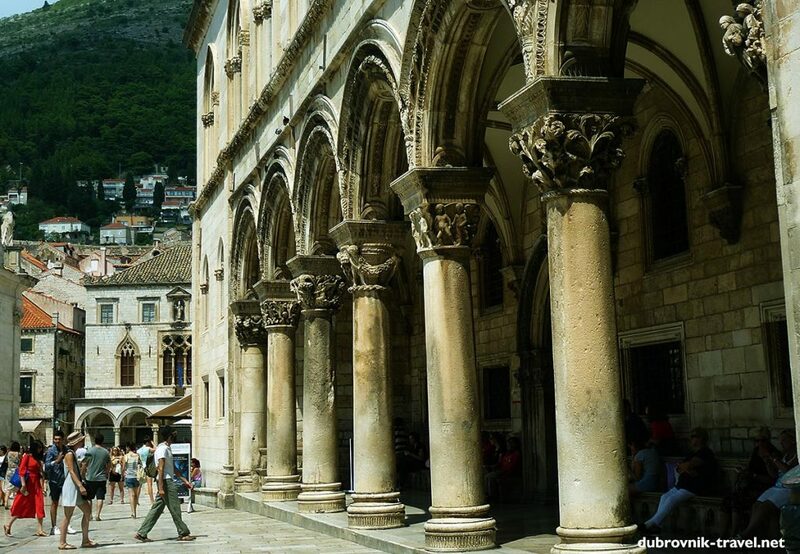 Sightseeing around Luza square is easy as all attractions are just there – The Rector’s Palace with its lovely colonnade (above photo), elegant facade, and inside the museum; the Sponza Palace amazing facade and interior nowadays housing local archive. Small Onofrio’s fountain is also there, on the corner of the Clock Tower constructed in the 15th century. St Blaise Church, named after the city’s patron saint, is just across the square with a statue of St Blaise with a miniature model of medieval Dubrovnik in his hands. Here you can visit an open-air market that opens in the mornings only, located just around the corner of Luza, behind the Cathedral. You can buy some fruit or vegetables here or just stroll around stopping to see the statue of poet Gundulic. Leaving Gundulic’s square and crossing the Luza along the side of Cathedral, walk through the small arch in the corner, to the Old Port towards the Porporela. If you are into the underwater life, stop to visit the local aquarium or just proceed along the sea passing by Sv Ivan tower towards the end of the breakwater. It is already midday and time to cool down in the sea if you feel like. Do it here in Porporela, one of the best swimming spots in the town. The first thing you will notice on the facade of Franciscan Monastery is its Church portal with amazing Pietà relief. Get inside the Monastery to see its medieval cloister, colonnade, columns and capitals as well as an old pharmacy museum. Take a few minutes to see this imposing fountain decorated with numerous carved masks situated just a few steps from the exit of the Old Town. By the time you complete this part of the sightseeing, it must be already 2 pm. As this is already early afternoon, the best option now is to avoid the hot part of the day to either go to relax in local Gradac Park or take to the Sulic beach that is situated in the near vicinity of Lovrijenac (St Lawrence Fort). Take a couple of hours in this lovely area to relax and recharge for the rest of the day. On your way back to the Town, climb the steep path to visit Lovrijenac. By the time you climb down the path from Lovrijenac and reach the Old town, it is already about 7 pm. Now it is the ideal time to visit Buza Bar for early evening cocktails. 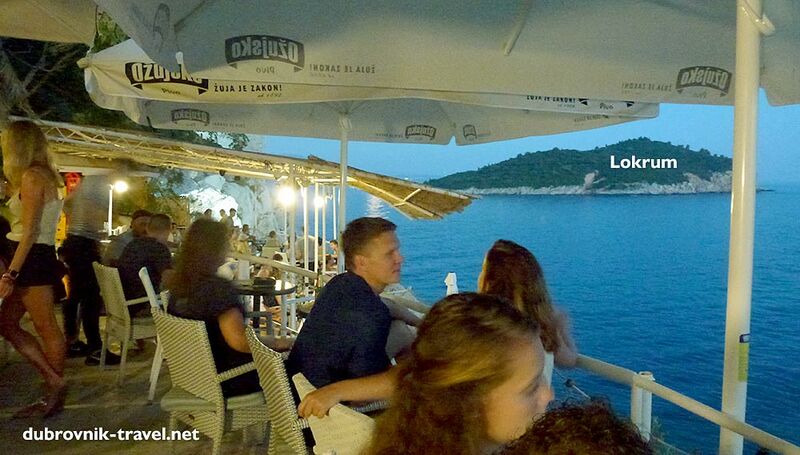 Situated on the cliffs of the Old town, this is the place to watch the sunset over Adriatic. Now, it is dinner time and you can head to any of the numerous old town restaurants that you prefer. What I usually do is to go back to Pile, to Dubravka 1836 restaurant for a meal. The restaurant features magnificent views over the Bokar fortress, town walls and the Pile Bay. And on the clear nights, the starry sky is just there. Also, it is not as expensive as some neighbouring places so I stick to it. Here is a photo that I took on my recent visit. Notice the lovely night sky, stars and moon over walls. If you still feel energetic to continue with exploring this amazing town until the early hours, you will find several good nightclubs in the Old town as well as in Lapad. The Culture Club Revelin is just one to mention, situated on the easy walking distance – within Revelin Tower near Ploce gate. 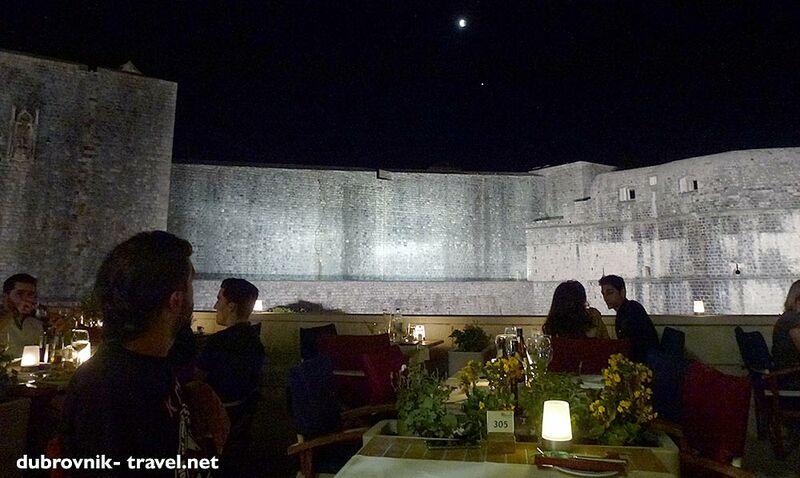 More about the nightlife of Dubrovnik in another post.